BRUSSELS, Belgium -- The European Union and United Nations condemned plans to hold elections in rebel-held areas of eastern Ukraine on Sunday, with the EU explicitly denouncing Moscow's support for the separatists' plans. 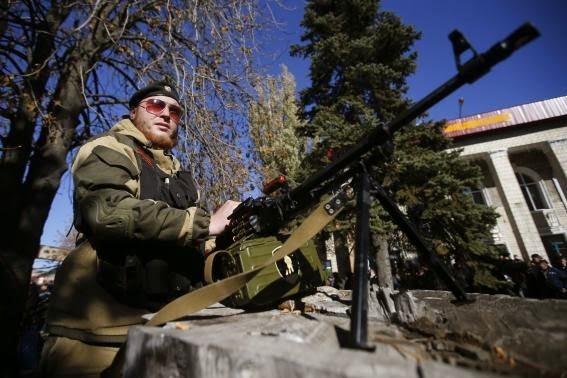 A pro-Russian separatist guards his position near the Kholodnaya Balka mine in Makiivka, outside Donetsk, October 29, 2014. In separate statements on Wednesday, two days after Russia said it would recognize the rebel ballots, U.N. Secretary-General Ban Ki-moon and the EU's foreign affairs service said the voting would undermine last month's outline peace deal struck in Minsk between Kiev and Moscow. While Ban's spokesman did not directly criticize Russia, a permanent member of the U.N. Security Council, the EU statement hit out at Russian Foreign Minister Sergei Lavrov for his comments on Monday in support of the separatists' plans. "We deplore Minister Lavrov's remarks about Russia's forthcoming recognition of the elections," the spokesman of the European External Action Service said, just as EU officials were trying to broker a deal in Brussels between Moscow and Kiev to ensure Russian gas supplies to Ukraine over the coming winter. The EU echoed a call from the United States following Sunday's parliamentary election in Ukraine for Russia to help ensure people in Donetsk and Luhansk could vote in local ballots being organized nationwide by the Kiev authorities on Dec. 7. "The holding of 'presidential' and 'parliamentary' elections, called by the self-appointed authorities, would run counter to the letter and spirit of the Minsk Protocol and disrupt progress towards finding a sustainable political solution." Ban's spokesman said the votes would be held in defiance of the national parliamentary victory of pro-Western parties. "The Secretary-General deplores the planned holding by armed rebel groups in eastern Ukraine of their own 'elections' on Nov. 2, in breach of the constitution and national law," he said. "These 'elections' will seriously undermine the Minsk Protocol," he added. "The Secretary-General urges all to uphold these agreements and work toward a peaceful resolution of the conflict." The dispute over the rebel vote has intensified the geo-political tussle between Russia and the West over the future of Ukraine, going back to the overthrow by protesters of the country's Moscow-backed president in February. Moscow supports the rebels, but it denies Ukrainian and Western accusations that its troops have taken part in fighting against government forces in a conflict that has killed more than 3,700 people.